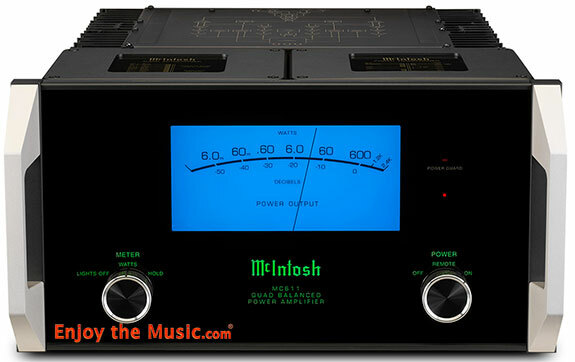 Yes, the McIntosh MC611 reviewed here is the same pair of power amplifiers of which Enjoy the Music.com's Creative Director Steven R. Rochlin wrote a Preview Review of McIntosh's MC611 in April. No, the MC611s I'm writing about here aren't the same review pair as Mr. Rochlin reviewed, because he purchased his sight unseen, and so they are in his home to stay. 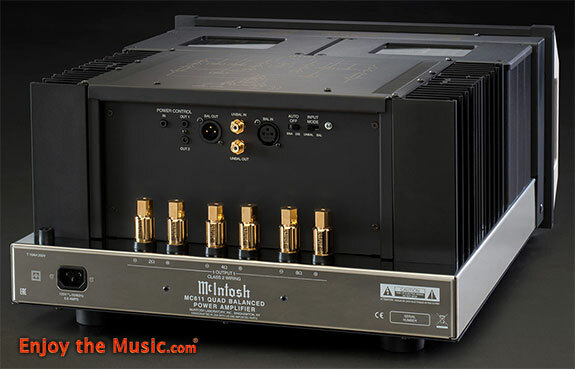 The purchase and subsequent review of these amplifiers was a surprise to me, and since I'd already agreed to review the same model of McIntosh amplifiers, I resisted, and did not read his review. Although, because he purchased the amps, I will assume that his review is a positive one. Since the amps were only in production for a very short time when his review was published, I'll also assume that he did not spend as much time with them as I have before sitting down to write my review. 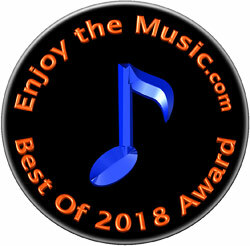 One can read into that as much as they want, but my goal is, and has always been when I write my equipment reviews for Enjoy the Music.com is to be as impartial as possible. I will do my best. These amps cannot be mistaken for any other brand of amplifier other than McIntosh. With their black glass front panels, their logo and model number illuminated in green below a large blue Watt meter, they should be instantly recognizable to just about every audiophile and even most non-audiophiles. Unpacking and setting up these beasts was a two-person job, each amp weighs just a hair under 100 pounds. And even though McIntosh does their best to make to make the task as easy as possible � the sides of the box within the box open like the petals of a flower so one doesn't have to invert the crates � it still demands one's time and patience to get them where they belong. Once they were in position, things became much easier. The speaker lugs are well-designed, as there is lots of space between each of the three sets of binding posts, one for each speaker impedance rating, and of course there are both balanced XLR and unbalanced RCA input connectors, as well as output connectors for to make bi-amp'ing or connecting a subwoofer easier. 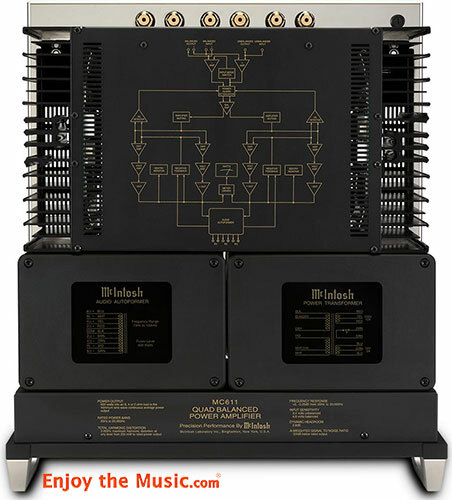 As is a McIntosh tradition, the top of each of the amp's Autoformer and transformers are labeled with specifications as well as a block diagram. What is new is that the top of the two large transformers have glass plates, and again, like the rest of the subcomponents on the top of the amp they have their specs and circuit information labeled in gold ink. 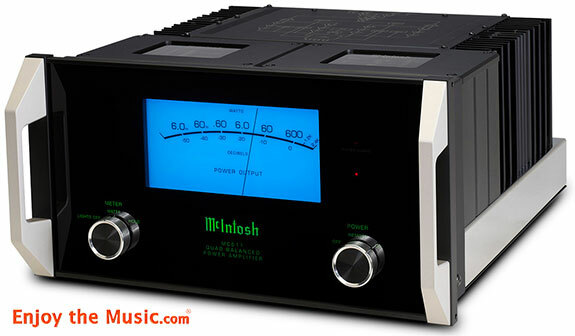 McIntosh claims that they have made many improvements over their previous 600-Watt monoblock amplifiers. One of the most significant improvements is that the amp's filter capacity has been doubled, which results in a large increase in the amp's dynamic headroom, which has gone from a very respectable 1.8 dB in the older model to an excellent 2.8 dB in the new MC611s, and because of its increased filter capacity there is also an improvement in the amp's low-end frequency response. This component's cosmetics have also been improved, as the new direct LED backlighting improves the front panel meter's appearance and "accuracy". The glass tops of the Autoformer and power transformer I mentioned above are a new feature, plus, the block diagram that has been added to the panel between the heatsinks are also new. The pair of Monogrammed Heatsinks that are behind them, which are connected to "advanced" high current output transistors lower the thermal equilibrium lag time. As on the previous models, there are three sets of Solid Cinch speaker binding posts, with one set for each speaker impedance level. But now there is more space between each post, to make speaker cable connection a bit easier. The MC611 now has an "eco-friendly power management" system, which shuts down the amp after a certain amount of time has elapsed where there is no input signal detected. McIntosh now uses internal wiring with a heaver gauge, and they also upgraded some circuit components. Not only that, but McIntosh now uses something called Power Guard (Power Guard has been a patented McIntosh technology for decades on our solid state amps and was in the previous 600 Watt model, it is not new on the MC611), which adjusts the input signal to make real time adjustment to prevent, in their words, "harsh sounding and potentially speaker damaging clipping", and Sentry Monitor, a protection circuit that works without fuses to disengage the output stage before current exceeds safe operating levels, then resets itself automatically when everything returns to normal. 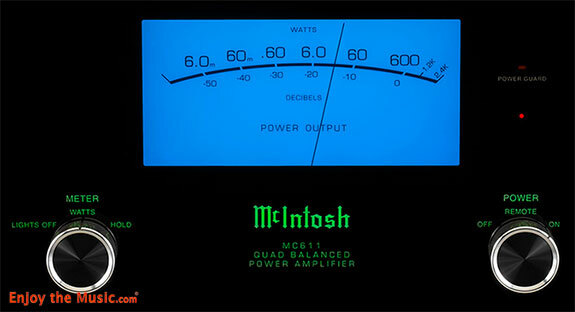 You might have noticed that the McIntosh MC611's moniker uses the term "Quad Balanced". 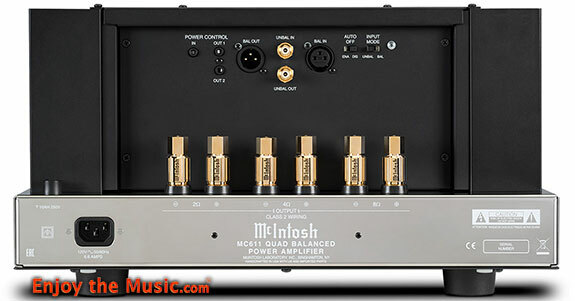 From the MC611's manual I learned that the Quad balanced design of the MC611 means that the amp is a fully balanced design from input to output, and each of the monoblocks consists of two matched power amplifiers operating in a push-pull arrangement, with their outputs combined in McIntosh's Autoformer. The Quad balanced circuit "cancels virtually all noise and distortion that may have crept into the audio signal". The MC611s were connected to my reference Sound Lab Majestic 545 speakers with a 12-foot run of Westlake speakers cable to the amp's 8 Ohm speaker lugs, where they remained for the entire review period, I only changed the taps to a different Ohm setting a few times for experimentation's sake. The Sound Lab speakers are designated by the manufacturer as "full-range", but still, their low-end is helped tremendously by a pair of 1250-Watt, 15-inch Velodyne subwoofers. I had a few preamplifiers in-house to connect to the MC611. For most of the review I used the vacuum tube powered Nagra Classic Preamp I reviewed in last month's issue, but I also spent some time using the Merrill Audio Christine Referenceand Mark Levinson No. 523 line stages. All three are excellent components, the difference between them was mostly nuanced, but the pricier Nagra seemed to match best with the McIntosh amps. I would probably have a tough time explaining to you why this was as there might have been a bit of slothfulness on my part, as I had just reviewed the Nagra and didn't feel like switching out preamps more than once, and as the Nagra sounded best on one or two recordings it remained in my system. The sources used were top-notch. The analog front-end consisted of the soon to be reviewed Analogue Artisan A-1 turntable with its integral tonearm with remote controlled VTA, with either Gold Note's top-of-the-line Tuscany, or the recently reviewed Etsuro Urushi Cobalt Blue phono cartridges mounted on its 'arm. A not-too-shabby back-up turntable system was my reference Tri-Planar 6 tonearm mounted on a Basis Debut V turntable. Either analog set-up was connected to my reference Pass Laboratories XP-15 or the recently reviewed Gryphon Sonett phono stage. The digital front-end was for the most part my computer-based music server connected via Furutech USB cable to an EMM Labs DA2 digital-to-analog converter (review forthcoming). Despite the difference in price, compared to the EMM Labs DAC my relatively affordable Benchmark Media DAC3 HGC performs way outside its price-class, making it a fine source for testing the McIntosh amps. If I got a hankering to play a 5" silver (or gold) disc, I used an OPPO BDP-83 Special Edition universal disc player, connecting its digital output to the DAC de jour if needed. Most of the gear is connected to each other via Accusound interconnects (review forthcoming), almost all of it from their top-of-the-line XL series. Power cable is mostly Virtual Dynamics, and the preamp and most of the front-end equipment are supported by an Arcici Suspense equipment rack. The listening room is treated by acoustic panels and LP shelves, and the listening room has two dedicated power lines that run directly to our home's circuit panel. It didn't take long to notice one advantage the McIntosh MC611 monoblocks had over my reference Pass Laboratories X350.5 power amp, the McIntosh amps needed hardly any time before they started sounding their best. The sound of my Pass Lab amp starts improving during its first 30 minutes of use but doesn't reach its full potential until at least 45 minutes into a listening session. The MC611s start sounding their best after only about five minutes and were smooth operators from the time onward -- from the time they were turned on in the morning until they were switched off at night. No sound came through the speakers that wasn't program material throughout their audition period, and when switched on or off they made no pops, clicks, hum, or any other sound I could hear. One would assume that at this price point this type of behavior would be expected, but I'm afraid this isn't always so. I've had some very pricey equipment that visited my listening room that wasn't nearly as well-behaved as the pair MC611 monoblocks that are the subjects of this review. I'll skip right to my conclusion: These amplifiers are somewhat paradoxical in their approach to sound quality. The McIntosh MC611 monoblocks can check all the audiophile sound quality boxes that I can think of, including but not limited to excellent frequency and transient response, a huge soundstage, pinpoint imaging, a natural attack and decay, and have a very detailed sound without making me feel as if a sonic microscope was being held up to the recording. Yet, the McIntosh MC611 monoblocks also have an extraordinarily beautiful sound. This is a type of sound that is difficult for me to describe in words yet is instantly recognizable. Throughout my audiophile lifetime I've always assumed that when it came to amplification, one can't have it both ways, either all the audiophile sound quality boxes are going to be checked, or its going to sound beautiful. Well, along come the McIntosh MC611 solid-state quad balanced monoblock power amplifiers, which not only sound "beautiful", but also sound as true to the source as any amplifier that has ever taken up residency in my system. I don't know how McIntosh manages to do this, or even if they know they have done this, but these solid-state amplifiers have many of the positive traits of high-powered, modern, high-end tube amplifiers, but without any of the disadvantages of being powered by tubes. I mean that both in the sonic and the physical senses, because these amps never got any hotter than very warm. Although, I have a theory that might explain why I feel that these amplifiers have such an attractive sound, which I thought of when I read that the Total Harmonic Distortion (THD) of the MC611 is rated at a miniscule 0.005%. Of course, great specifications don't always make for a great amplifier, as I'm a strong believer in the argument that the sound of an audio component cannot be fully explained by measurements alone, but still, this distortion specification is awfully low. But why the beautiful sound? Because music sounds beautiful, that's why. And using the THD spec as an example, and even though McIntosh doesn't publish many of the amp's other specs, I'm going to assume that they are equally as impressive. McIntosh's MC611 monoblocks sound pleasing to the ear because when reproducing the sound of well-recorded music, it does this with the utmost accuracy. And live, unadulterated music sounds pleasing to the ear. Or at least it should, unless the musician, producer, or engineer of that recorded it is purposely attempting to make it sound unpleasant (or playing too loudly). I don't mean to confuse anyone by my rather obtuse observations, I'm just attempting to reinforce the notion that the MC611 is one of the most beautiful sounding amplifiers I've ever heard, and at the same time is one of the most realistic sounding amplifiers I've ever heard. And this continues to blow me away every time I turn the MC611s'power on and play a record, disc, or digital file through them. What makes the "beautiful" sound of the MC611 even more difficult to put into words is when I played a recording that isn't well recorded. No, the MC611s doesn't "repair" these poor recordings to make them more listenable, but what this amp does is let me hear exactly what is on the recording, and at the same time it let me hear what the intentions of the artist, engineer and producer were when they made the recording. No one sets out to make a poor recording. Yet there are poor recordings in our collections, and despite this fact I was able to enjoy these recordings more than ever before. Thankfully, most of the records and digital files I love are well-recorded, so I didn't have to worry about this too much. One of the records I played more than once while the McIntosh MC611s were in my system was Carl Nielsen's Symphony No. 5 with the Bournemouth Symphony Orchestra conducted by Paavo Berglund. My copy of this is on a long out-of-print EMI LP [ASD 3036] that was released in 1975, but second-hand copies are relatively easy to find and are not too expensive. It's a great recording � EMI LPs from the 1970s are some of the best sounding classical LPs in my collection that were not specifically marketed as "audiophile" LPs. Most of the compositions by Danish composer Nielsen were written in the beginning of the 20th century, are mostly tonal in nature, in a style somewhat like Sibelius' but slightly more experimental, such as the practice of ending a work in a different key than the one in which he started, and other similarly "radical" practices than what was accepted at the time. Some ascribe his somewhat intense style to the strains in his personal life and career. Within his Fifth Symphony there were many parts of this LP that highlighted what the MC611s were good at, not only because it was able to reproduce a miniature of a symphony orchestra drawn to scale in my listening room. No, it wasn't realistic to the point where I could close my eyes and imagine I'm in the 10th row of the empty concert hall in which it was recorded, as we haven't gotten there yet, but there were certainly many moments when instruments playing solo or in groups seemed to enter the room, and there were moments of large-scale suspension of disbelief, even if for just for a split second. Nielsen's orchestration is sometimes quite complex, and this symphony is written for a large orchestra. In the second movement there is a part where a horn is jumping octaves, and that was especially noteworthy, mostly because I've heard it played through many different amplifiers, many of which bury the horn with the instruments playing simultaneously above it. The MC611 was able to place a dynamic distance between the horn and the rest of the instruments so I could not only clearly hear the horn's part, but also enjoy the instruments supporting it. All the other aspects of what makes a recording of a large symphony orchestra so enjoyable were expertly reproduced by the MC611s, mostly because of the combination of it being an excellent recording being played through one of the best amplifiers I've ever had in my system. The beautiful portion of the monoblocks' sound I spoke of came into play at any volume I chose, but especially when playing it at a "realistic" volume, because the sound coming through my speakers never became strident or had any other annoyances (other than perhaps the volume being a bit too loud!). During the finale Nielsen switches from a minor to a major key, with the horns blasting away at ffff. The realistic sounding trumpets and other brass never sounded like anything other than an extremely natural sounding, very loud horns, triumphantly sounding their call. It sounded fabulous! Very soon after the McIntosh MC611 monoblocks arrived in my listening room, I was lucky enough to attend a concert of the 1990s alternative rock band The Breeders. Not only did this motivate me to play some Breeders on the stereo, which I did, but also play The Breeder's leader Kim Deal's old band that she was in, The Pixies, namely their album Surfer Rosa. I chose to listen to a .dff file made from a rip of the SACD on Mobile Fidelity Sound Labs. Although Kim Deal is the leader of The Breeders, her first claim to fame was her role as the bass player and background vocalist in The Pixies. Kim Deal is all over this great album, not only is her bass playing noteworthy, but her background vocals are mixed at a relatively high volume. This album also includes the only song where she gets writing credit, "Gigantic", on which she also sings the lead. Not only do I feel that Surfer Rosais The Pixies' best album, it was also produced by Steve Albini, and is a blast to listen to on a high-end system. Mr. Albini's production methods make it practically a useless task to attempt to dissect all that's going on; sounds come and go out of the huge soundstage so quickly that I couldn't write them all down. This wasn't simply a matter of noting how he uses the studio's ambience by placing microphones at select locations close to and far away from an instrument or vocal, but his mixing techniques also seem to abandon any sense of what one might consider "reality". Or perhaps I'm getting that wrong, and it is more real, as if one is in the studio with the band as they are recording it. Thanks to the MC611 monoblocks the separation of instruments that came through my speakers was superb. I could focus on one instrument or background vocal for an entire track if I wished, that is, if it didn't suddenly move to a different location in the soundstage, which I assume was either purposely done, or might have been the remnants of a "punch-in", which is done to repair a recorded part by the musician or vocalist re-recording their part by recording over only a small portion of their performance on that particular track. Which is a perfect example of the MC611s detailed reproduction without sounding as etched or overly detailed. I could also hear evidence of this album being recorded on analog tape, as Steve Albini was wont to do. I could hear the tape hiss come in along with the drum tracks when they entered the song. The instruments and sounds on "Gigantic" and the rest of the album weren't only separated from one another, but much of the time could hear how the instruments, vocals, and sounds were surrounded by the air of the studio. This was quite a feat given this recording's crowded soundstage, which included guitars, a drum set, bass, and quite a few background vocals. The MC611s were able to separate the background vocals into discrete voices, again, and somehow never sounded overly detailed. At times there were so many background vocals that it would sound as if a crowd was standing and singing behind, between and sometimes outside the boundary of the speakers. When spinning this album in the past, on some systems, included mine before my current set-up, and especially on non-SACD versions of this album, I could hear what I interpreted as a bit of upper-midrange boost. This wasn't a digital haze that would sometimes occur on poorly mastered recordings, but perhaps as a bit of grain. Played through the McIntosh MC611 this upper-midrange boost didn't disappear, but simply presented itself as these frequencies being a bit boosted because this was on the recording. It was the sound of the studio, the "room sound" had an abundance of midrange energy, and instead of coming through the speakers as simply a boost in these frequencies, it came through almost as if it were a separate sound. I played this album a few times, as these McIntosh MC611 monoblocks were going to have to go back to their distributor soon after my review was finished, I wanted to enjoy this album as many times as I could while these amps were still in my system. If you've ever read my (mostly true) biography that is published on the website of Enjoy the Music.com, you'd learn that my first true high-end system when I was still in high school was built around a pair of McIntosh's long discontinued MC30 tube monoblock power amplifiers. Those amps were long gone by the time I acquired my second pair of MC30s in the 1990s, this time powering a pair of Magnaplanar SMGa's in a bedroom system. So, even though I might be somewhat familiar with McIntosh's much older tube amps, it obviously didn't prepare me in any way to expect what I was about to hear from McIntosh's MC611 Solid-State Quad Balanced Monoblock power amps. In fact, in all the years I've had as my reference, and all the other high-powered solid-state amplifiers I've reviewed over the years didn't prepare me for what I was about to hear from the MC611 monoblocks. What I heard coming from these McIntosh amplifiers was a sound like no solid-state amplifier I've ever heard before. Not only do they sound like no other solid-state amplifier I've heard before, but they sound nothing like any other amplifier I've heard before, period. McIntosh has managed to make a solid-state amplifier that sounds both beautiful and transparent and at 600 Watts each have enough power to drive my very power-hungry Sound Lab speakers. It was both a pleasure to listen to and with enough detail to make me feel as if I was not only hearing everything that was on a recording, but the intentions of the musicians, engineers, and producers that made the recording. Yes, in other reviews I've said that other amplifiers let me hear these intentions, but not with the combination of attributes that these McIntosh monoblocks possess. The MC611 monoblocks are stellar performers, and highly recommended to anyone that can afford to purchase them.